Making sure you have enough nutrition after a workout is just as important as before a workout. You need nutrition to repair the muscles and to bring your body levels back to the top, to then do it again the next day and to even speed up the recovery stage. You have to think about your glycogen levels because that gives you energy and aids recovery and helps maintain muscle. Taking this as a post-workout is the best thing to do, as muscle glycogen is depleted during a training session. Now you can have all that aid in one simple powder that is easy to take as well as nutritious and delicious. Introducing MAN Sport's ISO-Carb! 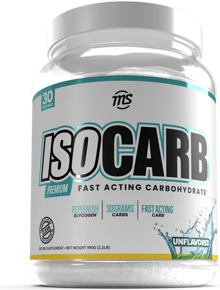 ISO-Carb is a pure dextrose powder to replenish glycogen levels. Dextrose is pretty much simple sugar. What sugar does is soak into the body to then have energy to use and burn fat. So because this powder is sugar based carbs, it digests extremely fast making it the perfect source for post-workout muscle glycogen replenishment. So after an intense workout, most of your glucose levels are depleted so you need something to bring it back to speed and create an environment for muscle aid and growth. On top of helping aid recovery and growth, this powder also gives you a spike of energy to push through your workout and give you motivation to keep going. Another great feature is that this provides an insulin spike that maximize the absorption of other nutrients and other supplements you take. So this powder has 33g of dextrose and 30g of carbs to help you along the way. 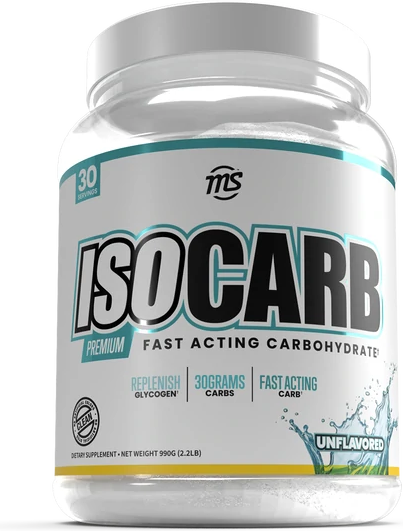 ISO-Carbs also have no additives, no artificial colors and dyes to help have your mind at ease. So do not deplete your body with good nutrients, take care of your body and feed it what it needs! We recommend to add 1 scoop with 12oz of cold water or your beverage of choice. Consume 1-2 scoops (1-2 servings) within 30 minutes of your workout. We recommend stacking with ISO-AMINO, Creatine Monohydrate and Clean Protein. Allergen Warning: This product is manufactured with equipment that process products that may contain milk, egg, soy, tree nuts, peanuts, wheat, fish, crustaceans & shellfish. Contains Milk and Soy Ingredients. Not for use of persons under the age of 18. Do not use if you are currently breast feeding, pregnant or plan to become pregnant. Keep out of reach of children. Consult your doctor prior to use if you have any medical conditions or if you are taking any other medications. Discontinue use immediately if you experience rapid heartbeat, dizziness, vomiting or other similar symptoms.